LEMON, SPINACH, CHICKPEA SALAD ...a great spinach salad recipe ...try this one ! Nice ! Put the drained chickpeas into a large mixing bowl. 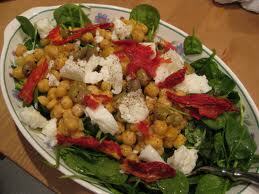 Combine the remaining ingredients with the chickpeas and stir well with a wooden spoon. Allow the flavors to marry by marinating in the refrigerator for at least an hour. Remove from the refrigerator and stir well before serving. Serve cold or at room temperature. The spinach salad recipes makes 6 servings. Enjoy it !